Energy & Climate Change - CO2 reductions and sustainable transport. THE PROJECT TEAM WILL CREATE THE GLOBAL STANDARDS BLUEPRINTS. CIVIL ENGINEERING, SCIENCE & TECHNOLOGY RESEARCH, SOLUTIONS & DESIGN. GLOBAL STANDARDS AGENCY (FGOSA) TO LICENSE CIRCUIT BUILDERS & OWNERS. BUSINESS-FORECASTS, CIRCUIT-FINANCING and COMPUTER MODELS. Pipeline-capsule, underground, rapid, electric, freight transport. GOODS-IN and WASTE-OUT computer-guided, lightweight capsules, travelling through interlinking 100 km circuits serving farms, producers, processors, packagers, wholesalers, retailers and recycling units. A typical dense-urban 100 km circuit will connect approximately 400 terminals at senders’ & receivers’ premises. Freight transfer depots will transfer cargos to and from traditional lorries, vans, pallets, waste-trucks and trains. Regions served by FOODTUBES will benefit from substantial road, rail & air traffic decongestion, from faster and smaller deliveries and cleaner street-level air. We calculate that Foodtubes will replace food vehicles (25% of freight) and the same amount of other vehicles (25% of freight) being 50% of freight vehicles from city streets in zones served by Foodtubes underground, electric, freight-capsule-pipeline circuits. Systems will be installed using No-Dig methods, in 100km pipeline circuits, with about 400 terminals to and from retailers, wholesalers, manufacturers, farms, recycling-depots and other locations. For example - In Croydon, London, with 130,000 homes, Foodtubes will replace 700 vehicles a day, save 90% of delivery fuel /energy and reduce CO2 by 8% or more; this will relieve the traffic-gridlock which Croydon suffers daily. Foodtubes lightweight capsules, 1 metre x 2 metres, carry 1.57 cu metres and up to 2 tonnes – which is the same as the wire-cages now loaded into supermarket vehicles, for deliveries from distribution-hubs to retail stores. Environmental benefits mostly stem from not using the 5 to 50 tonne vehicles. A lightweight-freight-capsule will be charged at 4 euros per journey and a typical circuit will make 70% profit. FOODTUBES-Circuits will be designed for Dense-Urban, Urban, Rural and Wilderness regions. Diverse specialist capsules will be designed to carry a wide range of cargos from farm produce to ready-for-sale supermarket goods. Pipe-Terminals will be installed at supermarkets, shopping malls and markets, colleges, schools, large offices & institutions and at waste recycling depots. Across countries like the UK, FOODTUBES will annually save up to 8% of man-made CO2 and other global-warming agents and street-level air pollutants. In less industrialised nations, where transport is a larger percent of overall pollution, the calculations indicate more than 8% savings. CO2: 92% of the fuel used to transport food and “supermarket consumer goods” moves the vehicles – only 8% moves the cargos. Substantial annual savings, globally from 1 to 4 billion tonnes of CO2, and costs savings, with faster, targeted deliveries, could be achieved, if the global food industry installed regional, and in due course, international, food pipeline systems delivering goods direct to supermarket and other loading bays. FOODTUBES capsules could be powered by air, other fluids or linear-induction-motors. Of the savings, 23% come from replacing road-lorries (HGVs) and vans with lightweight capsules, and 77% from the traffic decongestion impact, freeing all traffic. MWVs: Society transports water and food daily. The heaviest of these cargos, nearly 200 times heavier than the food transported, is water, mostly transported in pipelines, not in rail or road vehicles. Food could also be transported in pipelines; in lightweight capsules. The engineering principle of MWV (minimum weight vehicles) reduces the weight of the vehicles relative to the cargos. Pipelines are the ultimate MWV being motionless “conveyors” which pump their cargos with little energy, noise or pollution. Pipelines inexpensively, continuously and efficiently deliver water hundreds of kilometers and in and out of most buildings. Oil and gas pipelines transport their heavy cargo long distances, across difficult, wild terrain - and safely, out of sight, under and through urban areas. OPERATION: Food pipeline-capsules can be powered by Linear Induction Motors, and/or pneumatically, with the cargos contained in electronically addressed, high speed, lightweight capsules (e.g. 1 meter diameter x 2 metres long), which navigate by signalling ahead to direction gates. Like existing large diameter water, gas and oil pipes, FOODTUBES and the capsules can be built by local economies. The network/s will be computer controlled and systems standardised globally. If most food-road-rail transport was replaced, the equivalent capsules will use 40 to 80 times less energy and will greatly reduce street-level pollution and free-up congested roads, to the benefit of all. Operated as a business; an average FOODTUBES CIRCUIT will be 150klm long, serving several hundred terminals or customers’ locations; renting capsule space will be highly profitable and competitive. CAPITAL: Installing FOODTUBES is likely to cost less than continuously repairing existing, heavily used and congested major roads - damage caused mainly by HGVs of, in Europe, up to 6 axles and 44 tonnes laden weight – and even heavier in the USA. Like large diameter water, gas and oil pipes, FOODTUBES can be buried for long distances, be laid underwater, linked internationally and take shorter routes than roads take to farms, processors, distribution hubs and supermarkets. A typical 150 km circuit, owned privately or as a public utility, may cost $500M to install and will last for many decades. Cargo-capsule charges could be 5 times less than equivalent road-freight and cost 90% less to transmit; making each circuit a highly profitable enterprise. FOODTUBES could become the most effective way to move food and consumer goods within and between regions and will address issues including Free-Trade, Food-Miles, Food-Mountains, Disaster Relief, Food Cooperatives, Global-Warming and Street-Level-Pollution. Dr. Jonathan CARTER, Imperial College, London. Director of Container World (transport routing). Application of evolutionary optimisation methods (Genetic Algorithms, Genetic Programming) to numerical problems in earth science and engineering. Partner - IPR – Boyes Turner, Lawyers, Reading, UK. Sarah Hadland is an experienced, international, intellectual property rights (IPR) lawyer. Sarah’s clients include multinational public companies and small new-start clients. Sarah qualified as a solicitor in 1995 in specialist intellectual property firm, Bird & Bird. From 1996 – 2006 she specialized in intellectual property law at Eversheds in London and in 2007 became Director of Intellectual Property at Pitmans in Reading, moving as Partner to Boyes Turner in 2010. Degree in French from the University of Birmingham. Diploma in intellectual property law from the University of Bristol. Sarah has experience in both contentious and non-contentious matters, including licensing, agreements for the exploitation of intellectual property rights, management of IP disputes particularly in relation to design rights, trade marks, domain names and copyright and management of substantial IP portfolios. 16 Brookside, OXFORD OX3 7PJ, UK. Noel Hodson, director SW2000 Intelligent Transport (SW2000) is a professional project planner and project manager with 30 years experience. Noel has a wide range of practical experiences including coordinating EC IST projects. He has taught Project Management and Business-Planning at business schools and has trained many business consultants in these skills. Noel was Managing Director and Production Director of Mallalieu Engineering, a motor vehicle prototype workshop which developed Microdot, possibly the world’s first hybrid petrol/electric car – giving him an enduring interest in energy and fuel efficient transport. Following 25 years as founding and managing partner in an accountancy practice, then as a Business Expansion Specialist, including promoting an £80M Oxford Research Science Park in conjunction with Wolfson College; in 1988 Noel Hodson set up SW2000 – to help to save the planet by reducing business travel. From 1988 he conducted Flexible Working, Telework and Information Society workshops in Oxford, Washington & New York, attended by HR directors from more than 150 major employers. Clients have since included BT, EC funded IST projects, WHO (Geneva), World Bank (DC), TfL, Bank Austria, Dresdner Bank, Nat-West, Prudential, many other major UK and USA employers and hundreds of smaller businesses, innovators and inventors. He creates Excel based Project-Planning-Tools for clients. Tel +44 (0) 1865 760994 email noel@noelhodson.com. 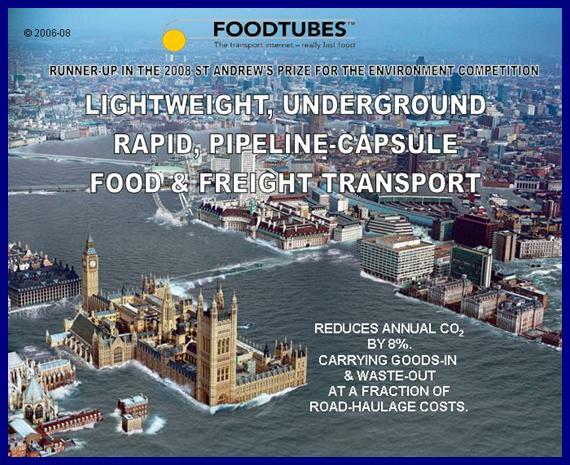 FOODTUBES – Transport & Communities Consultant. Dave Wetzel’s experience is broadly at an operational and high policy level on transport, local government, public finance, land use planning and innovative finance measures involving land value capture. A Fellow of both the Institute of Logistics and Transport and the Royal Society of Arts he writes articles and is an experienced public speaker, often giving lectures overseas. The development of economic solutions to the funding of public transport services and future transport developments through capturing land values, using economic theory and examples. His career has been largely devoted to the development of sustainable, affordable, accessible and reliable public transport. Together with others, he has developed an implementation theory that public services like transport can be efficiently, fairly and equitably financed through land value capture. This has recently been partly adopted by the British Government for funding £5 billion from commercial property rates for the new £15.9 billion rail line across London – the CrossRail scheme. He has met Government Ministers and their advisers over many years, submitted evidence to Government enquiries and is currently an expert adviser to the UITP (International Association of Public Transport), Transport Economics Commission’s Land Value Capture Working Group. Appointed by the Mayor of London as Vice Chair of Transport for London (TfL) in 2000. TfL was established by the UK Government in 2000 to combine 15 separate transport agencies in London (including London Transport Underground and Buses) into one organisation. He served for eight years from the beginning of TfL (until May 2008) and was in the forefront of successful innovative policies such as the bus expansion programme, the Congestion Charge, Travel Demand Management and the Low Emission Zone. Dr. Barrera, of the Fundacion Universidad-Empresa de Madrid (FUE), is the FOODTUBES executive responsible for creating the FOODTUBES Global Standards Agency and for Project dissemination, publicity and conferences. More than 20 years of diversified, world‑based, and result‑oriented international business and high‑level government experience in areas of advanced technologies at multilateral lending agencies (World Bank, Inter American Development Bank and as a consultant/expert for United Nations, European Bank for Reconstruction and Development and the European Commission), large companies (KAISER and ISCOR), and several Governments, in Europe and Latin-America, covering: due diligences, credit scoring, institutional risk and project portfolio analysis, investment projects identification, formulation, appraisal, monitoring and evaluation, procurement of goods and services, contract negotiations, as well as e- business development, corporate finance, project financing, financial engineering design, transference of (ICT) technology, joint‑venture promotion, structuring and negotiation, strategic planning and lobbying/public affairs. On the academic side, he holds a MBA, a PhD and an Engineering degree. Fully bi-lingual Spanish-English and working knowledge of French. Strategic advisor to La Caixa, largest saving bank, third bank and largest industrial group of Spain. Susan Collier is an internationally renowned designer with in-depth experience of the business requirements of manufacturers, wholesalers, retailers and major supermarket groups. Her clients include famous brand name corporations in Europe, the USA and Pacific Rim countries. Professor Collier will co-ordinate the work of visual designers and of design competitions for FOODTUBES and will interpret the instructions of those system owners and users, such as TESCO or Carrefour, who will want distinctive cargo-capsules, perhaps displaying advertisements and certainly indicating different technical types of capsules and special handling instructions. Managing Director of Force Engineering - UK. Force Engineering was founded in 1979 to promote sales, development and use of environmentally friendly Linear Induction Motors (LIMs). Force has supplied and advised many companies throughout the world on conveying, transportation, people moving, metal separation, and other LIM applications. The company is firmly established as a world leader in LIM technology. Force Engineering Ltd is a major player in the world of linear induction motors. Managed by Alan Foster since 1979, Force has now supplied over 18,000 Linear Induction Motors (LIMs) worldwide. Principal applications include people movers, roller coasters, extrusion pullers, baggage handling systems, postal sorters, and military equipment. All LIMs are purpose designed and built in-house for each customer by a team of specialist engineers. Andrew FRAYLING - Britain & Canada. Andrew Frayling, MD of SES Construction Software Ltd (SWIFT) is the FOODTUBES liaison officer and manager of the process to create an engineering computer simulation. Andrew has long practical experience of creating software and successfully managing software writers. Andrew was trained in Economics at Guelph University and Computer Sciences at the British Columbia Institute of Technology. He has managed a number of small businesses, a township in northern BC and has worked as a lecturer in Office Automation. Throughout the 1980’s he worked under contract for a number of large companies designing, implementing and training users within a customised computer system environment. From 1995 to 1998 he worked full time at Protocol Communications Ltd involved in European Commission Advance Communications Technologies programmes and helped write the DIPLOMAT project. The project was involved with Strategic Policy development for large companies interested in Telework. Since then he has been managing SES Construction Software Ltd. Supplying engineering and logistical software to the UK Construction Market. Brian leads a team of commercialisation professionals which manage the identification of commercially valuable Intellectual Property (IP), development of an IP protection strategy, commercialisation strategy, licensing and initial formation of early stage companies involving engineering and physical sciences technology principally from Imperial College London and other sources particularly in the field of energy and the environment. After joining Imperial Innovations in 2001, Brian has been involved in the formation of over 20 early stage companies, many more licence deals and winning externally funded contracts from various corporate and publicly funded research intensive organisations. Brian is widely experienced in business development and marketing in the engineering industry, having previously worked for John Crane Ltd, part of Smiths Group plc, most recently in business strategy and analysis. Before that he was based in Chicago, USA, responsible for business analysis and competitive intelligence. The earlier part of his career, based in the UK, was focussed on new product development, marketing communications and pricing strategy for European and international markets. The company's markets spanned a wide range of industries from automotive, chemicals and oil to pulp, paper and water in addition to original equipment manufacturers, from compressors to pumps. Brian is a graduate of Durham University with a BSc in Engineering Science and Management. Welcome to GL Industrial Services UK Ltd.
GL Industrial Services UK Ltd is a global engineering consultancy, service and solution provider, supporting clients in the gas, oil, water and electric industries. Previously trading as Advantica, the company became part of the international GL Group – Germanischer Lloyd AG – in August 2009. Robb Judd, representing GL INDUSTRIAL SERVICES and its software unit STONER-SOFTWARE is an executive in the design of pipeline systems. Dr Robert Judd. Dr Judd has gained broad experience of the gas and energy industries over a period of 20 years, with emphasis on technology development. This has ranged from upstream gas processing through to storage and downstream energy technologies. Much of Dr Judd’s work has focused on developing, coordinating and delivering technical projects, many of these cross-business, cross-sector, collaborative and multi-centred. GL INDUSTRIAL SERVICES was originally formed in the early 1970’s, to operate British Gas’ (BG) extensive R&D and technical programmes, including the development of the bespoke software used by Transco in network management. Through the purchase in 2001 of Stoner, a US-based technology company, GL INDUSTRIAL SERVICES consulting services and bespoke software applications were complemented by Stoner’s market-leading off-the-shelf software products for electricity, natural gas, water and petroleum industries. The company’s solutions improve clients’ knowledge of network performance and customer behaviour, providing the foundations for direct improvement of financial performance, operational efficiency, customer service and regulatory compliance. Leading energy and water delivery companies are working with GL INDUSTRIAL SERVICES to implement integrated solutions, allowing them to rapidly determine, distribute and act on network performance knowledge. The company supplies a wide range of consultancy services to support the planning, design and operation of oil and gas installations from up-stream through transmission, distribution and product utilisation. This includes the application of advanced engineering expertise, hazard and risk management, integrity management, asset optimisation, legislative compliance, metering and due diligence. Consultant to Foodtubes – Joint-Inventor. Fred Taylor is Halley Professor of Physics at Oxford University and Distinguished Visiting Scientist at NASA's Jet Propulsion Laboratory at the California Institute of Technology. His department at Oxford has made extensive observations of the atmosphere and climate using innovative instruments on Earth-orbiting satellites. He is the author of eight books, including Radiation and Climate (Oxford University Press, 2007) and Elementary Climate Physics (Oxford University Press, 2005). Professor Taylor will lead the scientific, atmospheric impact analysis for FOODTUBES, with emphasis on the CO2 consequences. Teddy Watson has had a multi-faceted career in the reinsurance industry, with over 20 years as a director in UK and USA on various group boards of reinsurance brokers, Greig Fester, Berry Palmer & Lyle and Watson Robinson & Associates. He has advised the UK, Japanese, Czech and many other governments, the European Commission, multilateral agencies such as the World Bank, corporates and insurers around the world. He has used innovate techniques to move risk from the public to private sector. He advises Oxford's Saïd Business School on the insurance sector and is Chairman of the British Schools Exploring Society. Katarzyna Rzeplińska - Rykała, MSc. Eng. has graduated from Warsaw University of Technology with specialization in environmental science; she holds a second Master Degree in the field of Indoor Environment from Technical University of Denmark. She has wide experience in organization of European Cooperation within Framework Programs. Since 2004 she is a deputy of the Head of Coordination European Team and she is involved in technology transfer, as well as technology dissemination and exploitation. She is also involved in international projects focused on building of pro-innovative society. Professor Henry Liu. President, Freight Pipeline Company (FPC), has a B.S. Degree in Hydraulic Engineering from National Taiwan University, and an M.S. and a Ph. D in Civil Engineering from Colorado State University. He is a U.S. Citizen, and a Professional Engineer (PE) registered in the State of Missouri. Henry Liu can claim with justification to be one of the most experienced scientists, industrialists and experts in pipeline-capsule transport. A search of the Internet will show his body of work. Prior to starting up FPC in 2001, Dr. Liu was Professor of Civil Engineering, and Director of Capsule Pipeline Research Center (CPRC), University of Missouri-Columbia (UMC). CPRC was funded by the National Science Foundation for 9 years as a State/Industry University Cooperative Research Center, during which Dr. Liu served as the Director and led a team of faculty and students to perform extensive interdisciplinary research in capsule pipelines, including hydraulic capsule pipeline (HCP), pneumatic capsule pipeline (PCP), and coal log pipeline (CLP). Agnieszka Sprońska, M.A., has graduated from the Faculty of Philology at Warsaw University at 2002. She has wide experience in development of the Human-Machine Interfaces (HMI) for industrial IT systems. She is also experienced in the filed of artificial intelligence and application of the ontology as well as semantics for information technology systems. Since 2004 she was involved in multimedia and visual knowledge acquisition also for industrial applications. Dr Roman Szewczyk received his PhD from the Faculty of Mechatronics of Warsaw University of Technology. During the recent years he has been involved in development of unique telemetry as well as control applications for logistics. He is involved in coordination of technological foresight projects, focused on transportation infrastructure. He has also coordinated projects connected with development of telemetry for transportation monitoring. For his scientific work he received award of Dean of Warsaw University of Technology (in 2002) as well as award of the Prime Minister of Poland (in 2004). He has published over 50 papers in refereed Polish and international scientific and technical journals, as well as conference proceedings. Assistant Professor at the Faculty of Mechatronics of Warsaw University of Technology with specialization in new generation of flow-meters with mechanical oscillator, used mainly in hydrology. In recent years he has been involved in development of rotational flow-meters sensors and laser transducers for flow and pressure. Dr. Turkowski is a lecturer at Warsaw University of Technology in the field of Industrial Metrology. He is also a co-editor of “Pomiary, Automatyka i Robotyka” journal. He has some 50 cited papers in refereed Polish and international scientific and technical journals, as well as conference proceedings, and is the author of a number of scientific textbooks. Managing Director, Pipeline Engineering (PE). Willy Watson, after 20 years at a director level in Industry, mostly related to international telemetry/SCADA projects, acquired Pipeline Engineering in 1997. Since then PE has become the world’s leading company in utility pigging technology for the international oil and gas pipeline industry. From its small beginning, the Company has grown, through exports, 20% year on year and today has 150 employees, offices in Abu Dhabi, Singapore and Houston and over 30 representatives around the globe. The Company has considerable expertise in moving devices (known as pigs) down pipelines. Part of this expertise is in providing wear resistant polyurethane sealing systems and support mechanisms to enable pigs to be propelled down the pipeline by gases or fluids. The Company’s design expertise has enabled complex multi-diameter piping systems to be pigged up to 2.5 km subsea or over pipeline lengths of up to 1000km, ranging in diameter from 4” to 72”. Graduated from Ryerson Institute of Technology, Toronto, Ontario, Canada, in Electrical Technology. Spent 5 years at Lamson Conveyors of Canada, working on designing the Electrical, estimating, starting up and servicing Automatic Pneumatic Tube Systems. At the same time, set up all of the above mentioned departments. Wrote installation and service manuals, set-up standard manuals and drawings for both the Canadian Division and Head office in Syracuse, New York. Pneumatic Tube Systems were first made by Lamson Corp., 200 years ago. In 1970, I founded Thorne Pneumatic systems providing the same services as mentioned above, plus developed a line of Single Line Reversing Pneumatic Tube Systems, both point to point and automatic (multi-station) systems. I patented a switching device and a “clamshell” carrier for Pneumatic Tube Systems. In 1975, Thorne began selling Central and Portable Industrial Vacuum Cleaning Systems, almost the same technology as Pneumatic Tube Systems, except instead of moving a carrier, it’s particulate. In 1985, Pneutrans Systems Ltd. was founded to sell and design Pneumatic Capsule Pipelines, exactly the same technology as Pneumatic Tube Systems. This required development of a very comprehensive computer program. I have presented and demonstrated the Pneumatic Capsule Pipeline for the last 10 years to the School of Mining Engineering at Laurentian University in Sudbury, Ontario, Canada, at the request of the school. Over the years I have displayed/demonstrated Pneutrans Systems Ltd. Pneumatic Capsule Pipelines at many Mining and Coal tradeshows, conferences and safety expositions. This includes six papers given on the subject of Pneumatic Capsule Pipelines. Pneutrans Systems Ltd. is currently working towards their first Pneumatic Capsule Pipeline order. Wojciech Winiarski, MSc. Eng., has graduated from the Faculty of Precision Mechanics of the Warsaw University of Technology in 1977 with a MSc in the field of Metrology. During the recent years he has been involved in development of flow sensors, as well as he was the person in charge of Polish National Research Committee projects. He is the co-author of 5 patents as well as 15 publications in refereed scientific and technical journals as well as conference proceedings. Since 1991 he is the Head of the Measuring Systems Department in PIAP. Alan Wolfson has had several careers, spanning academia, government and business. His last career was with Capital One, a large US-based consumer finance company, responsible for the development of the international business. He is now a strategy consultant and board director. USA & Global Business Development Consultant. Don is interested in scalable, international, innovative businesses and social initiatives. He has worked on several continents in varied industries and works with and is retained by venture capitalists, bankers, politicians and industrialists in the USA, London and elsewhere. His current interests include a national emergency warning system to alert millions of homes simultaneously; a program to rapidly build thousands of affordable, social-housing homes in mezzo-America; an IT enabled medical and psychotherapeutic training and network for autistic infants and their families; and, of course, FOODTUBES. Mr. Hoagland is an experienced entrepreneur having worked in international management and political development for independent and family holding companies with worldwide assets. He quickly recognizes problems in troubled companies and then provides global strategic and management plans for greater profitability. The assets under his management were in such diverse areas as portfolio management, hospitality, real estate and land development, international low-income housing, light-weight aggregate, computer chip construction, and international franchise development. His natural leadership talents, people skills, and negotiation abilities work best when collaborating with highly motivated teams, together transforming steadfast progress into solid profitability. Mr. Hoagland is an experienced entrepreneur having worked in international management and political development for independent and family holding companies with worldwide assets. He is known for his ability to quickly recognize problems in troubled companies and then provide global strategic and management plans for greater profitability. The assets under his management were in such diverse areas as portfolio management, hospitality, real estate and land development, international low-income housing, light-weight aggregate, computer chip construction, and international franchise development. Mr. Hoagland has found, managed and trained management for companies with annual gross revenues between $1.0 million to $2.2 billion with overall responsibility in excess of $6.7 billion in annual gross revenues. He has initiated and negotiated mergers, acquisitions and bankruptcies ranging from $5.0 - $750.0 million in values and founded several start-up ventures. He has strong management and negotiation abilities with leadership and people skills that work well with highly motivated teams driving towards solid profitability. In addition to traditional operational management and financial services, Mr. Hoagland served as the liaison for internal and external family issues. He dealt with multi-generational planning to grow assets and minimize taxes. He brought teams of professionals together to provide asset protection strategies and sophisticated solutions in estate management. In addition to sitting on the Board of Directors for numerous domestic and international companies, Mr. Hoagland has served as a board member for several not-for-profit organizations. Among those he served as the President of the Board of Trustees of the Rocky Mountain Chapter of the Leukemia Society of America, a board member with Adoption Alliance, St. Mary’s Academy and the Montessori School of Denver.